Introduction: Ulceration in the mouth is a common occurrence and it is important for the physician to distinguish between the simple benign ulcers from those which are malignant. 1. Traumatic: The diagnosis is usually obvious with the clinical history. Patients may have ill fitting dentures or sharp teeth. The ulcer usually heals when the precipitating cause is removed. 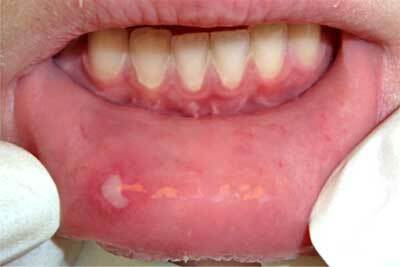 On examination they are white, small, circular, deep , painful ulcers with surrounding erythema. 3. 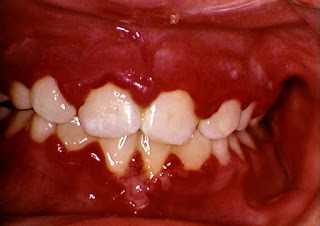 Infective: May be due to bacteria ( Acute ulcerative gingivitis), Viral ( herpes simplex), or fungal (Candidiasis) . In Acute ulcerative gingivitis (also known as Vincent's angina) patients present with swollen gums with small ulcers, which may spread to the buccal mucosa. There may be bleeding from the gums along with constitutional symptoms like fever and malaise. There is associated tender lymphadenopathy. diseases. It appears as red patches on the buccal mucosa, which are covered with white patches of desquamated epithelium mixed with fungus. Herpes Simplex presents as painful vesicles which ulcerate. The patient may be immuno-compromised. Herpes zoster may sometimes occur on the palate in the distribution of the maxillary division of the trigeminal nerve. There will be severe pain and ulceration. 4. Neoplastic: Squamous cell carcinoma of the mouth occurs as ulcers with hard edges and bleed. Mostly seen in older patients and a history of leukoplakia may be present. Also other predisposing factors like smoking, syphillis, sharp tooth or long term use of spices may be present. 5. Skin Disease Associated: Certain skin disorders can cause ulceration in the mouth like in linchen planus, pemphigus, pemphigoid and bullous erythema multiforme. Bullous erythema multiforme in a child secondary to drug reaction. 6. 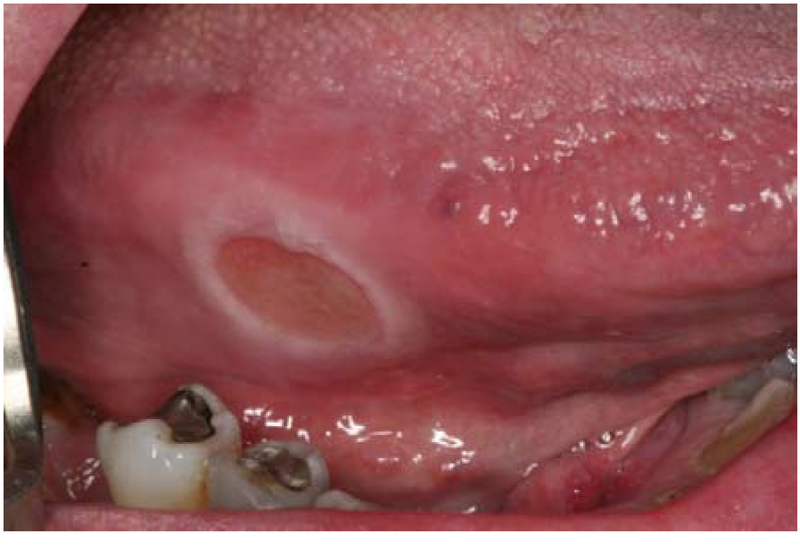 Connective Tissue Disorders: Oral ulcers may be associated with SLE but patients usually present with other features of the disease rather than for the oral ulcers.